Nintendo's most high-profile stab at downloadable content to date is now available for purchase on the Wii U's eShop. For those of you unaware, New Super Luigi U made its Wii U eShop debut this morning. The title, which will be released in standard retail disc form on August 25, is actually something of a downloadable content addition for New Super Mario Bros. U. To Nintendo's credit though, this isn't a simple skin pack or horse armor release. 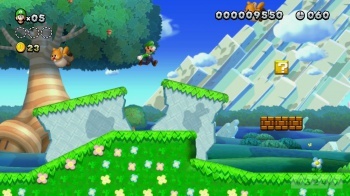 New Super Luigi U replaces all of the stages found in New Super Mario Bros. U with new, more difficult ones. Further, the DLC drops Mario as player 1 and instead casts players as Luigi. As long-time Mario Bros. fans would expect, Luigi handles differently from his brother. He can jump higher, but has less traction on solid ground. So, how much is all of this going to cost you? A cursory glance at the Wii U's eShop reveals a $20 price tag, though it should be noted that you'll need to own a copy of New Super Mario Bros. U to play the DLC. If you'd rather wait until August for the retail iteration of the title, that's an option, but if you choose that route you will be missing all of the base content originally included in New Super Mario Bros. U.
Alongside the release of this DLC, Nintendo also dropped a new update for New Super Mario Bros. U. Next time you fire up the game it should automatically update itself to version 1.30. This patch includes only two major additions: All the necessary technological changes to prepare New Super Mario Bros. U for the New Super Luigi U DLC (obviously), and support for the Wii U Pro Controller. I mention this because if we're being totally honest, as much as I'm psyched for Luigi's adventure, I'm even more pleased that I'll finally be able to sit on my couch and play a proper 2D Super Mario Bros title with a real, honest-to-Bowser controller. It feels like 1995 all over again!